Parent-Teacher Conferences are this Thursday, October 4th from 4:00-9:00 p.m. and Friday, October 5th from 11:00-7:00 p.m. Elementary parents must sign up for their conference time by clicking here. Middle school conferences are held on a drop in, first come, first served basis. For more information on conferences for both elementary and middle school, please see the letters on the CPA website. The CPA-PTA would love your help in providing meals for the teachers and staff during conferences. If you are willing to bring an item, please complete the form on the CPA website and return it to the school, or sign up online by clicking here. The Destination Imagination Kick Off meeting is tomorrow, October 2nd at 6:00 p.m. in the CPA library. See the flyer on the CPA website for more information about this great opportunity for students at all grade levels. As a school, we have recorded 1,721 volunteer hours for the year. Please remember to record all of your volunteer hours and help us reach our volunteering goal of 14,000 hours for the year. Demonstrating strong parental involvement can help CPA qualify for grants and other funding opportunities, so it’s important that every hour is recorded. 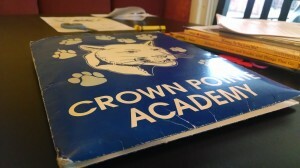 You can fill out the paper log and return it to the office, or you can record your hours online by sending an email to volunteer@crownpointeacademy.org. Make sure to include your name, your student’s name, and the total hours volunteered for the month in the email. Thank you!